Sephardi Chief Rabbi laments intention to officially sanction soccer games on the Sabbath. 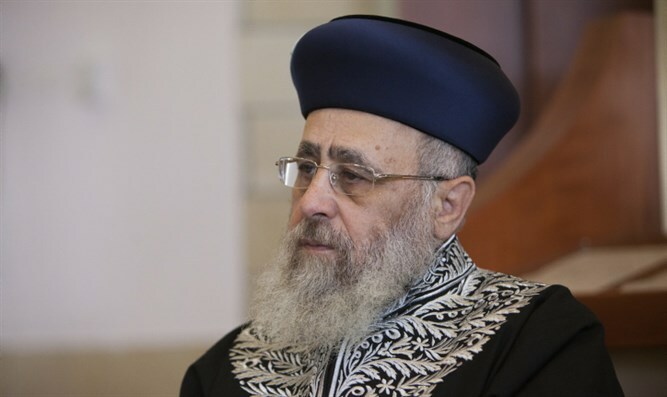 The Sephardi Chief Rabbi of Israel, Rabbi Yitzhak Yosef, spoke on Saturday evening about the intention of a ministerial committee to officially allow soccer games on Shabbat (the Sabbath). "If you have soccer on Shabbat, all the playing fields will have soccer [games] and people will come there by car. Our Sephardim, whom we worry about, are traditional people who come to pray at synagogue - but they will go to Rishon Letzion and Herzliya instead. I was there a few times on Shabbat, and saw what happens there. Many people are not so religious, maybe even Shabbat desecrators, but as soon as there is soccer on Shabbat with the permission of a ministerial committee, woe unto us,” Rabbi Yosef said. "Woe unto us for this thing they plan to do, it's worse than the train. How much noise they made about working building the train tracks on Shabbat - there it was unclear if the workers were Jews or non-Jews, but they made noise about it, right? Here, it’s even worse. It’s not just workers, but all the Sephardim who will fail in desecrating the Shabbat,” the rabbi said.